Tome o chá da manhã ou desfrute de um churrasco em um passeio de 3 horas pelo porto de Sydney e com um cruzeiro com snorkel. Ouça a narração de especialistas enquanto seu barco desliza por pontos importantes, como a Sydney Opera House e a Sydney Harbour Bridge. Pare por uma hora na Ilha dos Tubarões para um mergulho com snorkel ou praia. Você vai desfrutar de vistas privilegiadas dos principais pontos turísticos de Sydney a partir da água! Parta para o porto de Sydney a partir de King Street Wharf, a bordo do seu barco de cruzeiro turístico e de snorkel em Sydney, e ouça comentários informativos sobre pontos de referência como a Sydney Opera House e a Sydney Harbour Bridge. Se você selecionou o passeio da manhã, desfrute de chá, incluindo bebidas quentes, bolos variados, biscoitos (bolachas) e bolos. Em um cruzeiro de tarde você é tratado com um churrasco opcional servido no barco. Vinho, cerveja ou outras bebidas estão disponíveis para compra na barra licenciada (por conta própria). 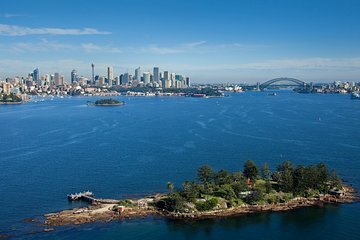 Seu barco leva você até a Shark Island, uma ilha idílica localizada no Sydney Harbour National Park. Você terá aproximadamente uma hora para explorar a ilha, incluindo nadar nas águas cristalinas. Apresenta-lhe qualquer vida marinha que possa ver no mar, incluindo até 600 espécies marinhas diferentes. Se preferir ficar em terra, pode optar por dar um passeio pela ilha. Descanse em áreas sombreadas de piquenique e na praia, encontre piscinas naturais ao longo da costa e desfrute de incríveis vistas de 360 graus. Certifique-se de ter sua câmera à mão para algumas ótimas fotos do horizonte de Sydney a partir deste ponto de vista da ilha. Seu cruzeiro de 3 horas pelo Porto de Sydney termina com o retorno ao cais. Atenção: se as condições meteorológicas não permitirem o desembarque na Ilha dos Tubarões, você visitará outra ilha no porto. The boat ride around the harbour is nice, the food was delicious, and the island itself was absolutely beautiful. Unlike the below reviewer I had no problem getting onto the island. I was not charged the extra 7 after I showed them the voucher I had that included the entrance fee. I also did not have to pay extra for snorkeling gear. However, the snorkeling gear they provided was very dirty so we weren't interested in using it at all. The island itself is not the place to go for snorkeling. I repeat, if you are interested in snorkeling DO NOT GO HERE! There is no place to easily access the water it's all rocks, and the water itself is not clear enough to do any good snorkeling. Even the locals were disappointed in how it was set-up. The views from the island are very pretty, though. So basically if you want some decent food and nice ride around the harbour this is the trip for you. If you're looking for swimming or snorkeling then don't bother. Let me start by saying that this was my bridal shower. When I booked this cruise for myself and four of my lovely bridesmaids, I envisioned sun sand and beautiful sea life. Granted the food was lovely and the staff were quite friendly and apologetic each and everytime an issue arose. We were then told that we had to HIRE the snorkle equiptment depite this also being listed in the inclusions on my ticket and your website. After already being ripped off once I was not going be ripped off a second time and insisted that we would not be paying that, as it was in the inclusions listed on my ticket. Both times we got the excuse that those inclusions were meant to have been removed off the website. To advertise something and then not meet that is an issue for Fair Trading and I will be bringing it up with them. These both led to awkward situations and we were left confused and embarrased but never the less we left the boat to wash off our dissapontment. It wasn't until we had landed and were on the wharf waiting to be instructed where to go to swim that I realised just how disorganised your tour is. There were two beaches available, one that looked nice enough, but had no way to actually get to it without scaling walls, and another which was all rocks. The guy said not to go swimming near the rocks because that's dangerous and then pointed to the other beach which would difficult to climb down to, or get back from. The island itself was really unkempt, and parts of the paths on the island had basically washed away, so that we had to climb over boulders. I went for your tour because you had inclusions, like the snorkeling gear, and the national parks cost, I was after something that we did not have to worry about anything during the day, that everything was paid for. I was not expecting to be ferried out into the middle of Sydney Harbour and have extra money extorted out of me. I will be contacting Fair Trading about being charged twice for entrance onto the island, and then your companies attempt to charge me twice for snorkelling gear that was faulty. You would also consider something called a Sydney Harbour Swim and Snorkel Cruise would drop you off somewhere where it was actually possible to easily swim and snorkel. I do believe in allowing companies to make amends, so I will not be putting my complaint into Fair Trading until next week.